Seven Thailand government agencies have today (Jan 21) inked an agreement that will allow the children of refugees and asylum seekers to be freed from Immigration Detention Centres (IDC). The Memorandum of Understanding on the Determination of Measures and Approaches Alternative to Detention of Children in Immigration Detention Centres outlines the procedures and policies to be followed when refugees or asylum seekers with children are apprehended. 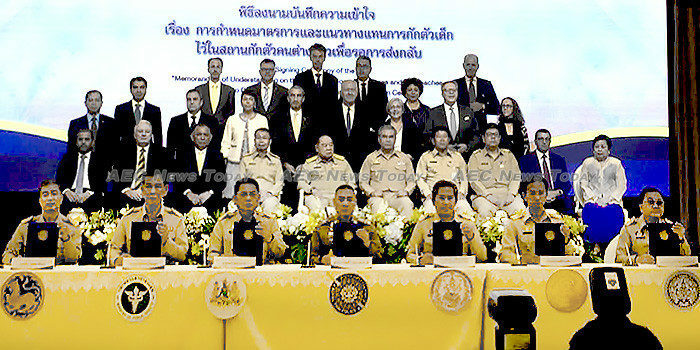 It was signed by the Ministry of Foreign Affairs, (MFA) Ministry of Social Development and Human Security (MOSDHS), Ministry of Interior (MoI), Ministry of Education (MoE), Ministry of Public Health (MoPH), Ministry of Labour (MoL), and the Royal Thai Police (RTP). The document signing comes just 14 days after Saudi Arabian woman, Rahaf Mohammed Mutlaq al-Qunun, was granted unprecedented approval to file an asylum application within the country’s borders. Thailand historically has neither allowed asylum requests to be made in the country, nor recognised the legal status of refugees entering the kingdom. Today’s agreement follows a pledge in 2016 by Thailand Prime Minister General Prayut Chan-o-cha at the United Nations Leaders’ Summit on Refugees in New York to end the practice of immigration detention of refugee and asylum seeker children. Welcoming the signing, Giuseppe De Vincentiis, United Nations High Commissioner for Refugees (UNHCR) representative in Thailand said: “This MoU is a positive example of Thailand’s humanitarian approach to refugees and asylum seekers, and is supported by the recent release of mothers and children. “As an immediate next step, UNHCR hopes that the remaining mothers and children who are still in detention centres will soon be released and all separated families reunited”, he added. Exactly how many children will benefit from the signing is unclear though. A spokesperson for UNHCR said that the number of people, including children, held in Thailand IDCs is unknown “as there are currently no verified figures available”. However, “since October last year more than 200 children and their mothers have been released or had their bail extended”, the person said. Mr Vincentiis said UNHCR “continues to work together with the Thailand government and other partners in seeking alternatives to detention, and improving the protection environment for asylum seekers and refugees in Thailand”. The MoU comes against an apparent softening in the country’s human rights policies, along with a hardening of its zero tolerance policy to those in Thailand illegally. In recent times thousands of foreigners illegally in the country have been apprehended in coordinated, targetted raids. At a meeting at the Foreign Correspondents Club of Thailand (FCCT) last week Thailand’s immigration department boss, Lieutenant General Surachate Hakparn, vowed to never again force migrants and asylum seekers to return home involuntarily. The comments follow similar remarks he made during the frenzied period between Ms al-Qunun being detained and told she would be returned to Kuwait and then Saudi Arabia, and the original decision being reversed. In 2017 the Thailand Cabinet approved in principle a proposal to finalise and implement a screening mechanism for undocumented immigrants and refugees and last month signed up to the Global Compact for Safe, Orderly and Regular Migration, a new UN agreement on migration. According to figures from the International Labour Organisation (ILO) last May Thailand is home to some 3.2 million documented migrants. In 2017 UNHCR put the number of refugees in Thailand at about 102,000people. Last year Thailand saw its ranking on the US Traffic in Persons report issued by the US State Department increase from the Tier 2 Watch list where it had sat for two years, to Tier 2, reflecting “increasing efforts compared to the previous reporting period”.